Just wanted to reflect on the wonderful ceremony I officiated at a couple of months ago and I only recently had the photographs back from. It was my first hand fasting ceremony and I have to confess to being a little nervous about being able the tie the fastenings without getting them all in a tangle but thankfully my worries were needless. 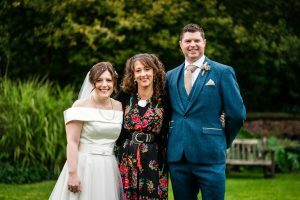 The couple getting married were such a warm and welcoming couple and as we spent several, pleasant mornings drinking coffee in Bakewell, as this was a half way point between Leek and Sheffield, I got to know them and their delightful daughter really well. They made me feel very much a part of their family so it really was an honour on the day to be marrying them. Despite the horrendous weather forecast suggesting there was 60% chance of rain at every hour throughout the day, the groom remained highly positive about us continuing with the plan to carry out the ceremony in the gardens. 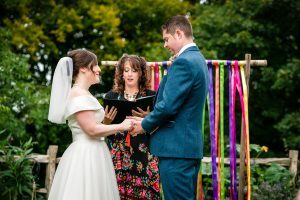 They had ribbons hanging from a backdrop, hay bales for family and friends, lanterns, flower sprays and a professional singer to accompany the bride down the aisle to ‘their’ song. Admittedly, he had to fight against the wedding bells peeling out from the church next door but it all supported the occasion and provided amusement. There are many more photos from this ceremony in my gallery. 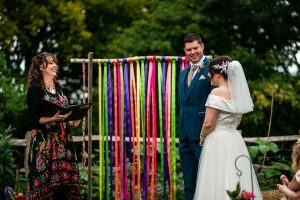 If you would like a handfasting ceremony or an outdoor ceremony in a special place, it doesn’t have to be liscensed, please call Rebecca on 07528637825.